This was my first book by this author and it's also the first in this series...I loved it!! I had a really hard time putting it down when real life interrupted. The beginning of this book had me holding my breath almost literally..Holy Moly what a start..I could tell there was a bit of history I didn't have between Mac and TR and found out that there is a prequel and I can't wait to read that one now as well. Mac was an ultimate leading man and I loved his alpha side, but I also loved the challenge that TR posed proving she wasn't this weak little thing that let people walk all over her. I loved that this book had everything from danger to suspense to little twists and turns placed perfectly. The storyline was awesome, smooth and easy to follow. I loved the other guys in Cover Six and hope this series includes every one of them. So look forward to reading the next, I fell in love with Daryl in this story. Awesome start to this series. I am so happy to finally get the rest of Mac & TR's amazing story after the tease from Covered by a Kiss! 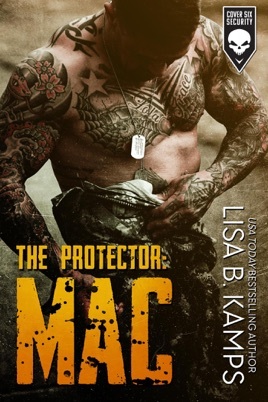 I honestly can't begin to say enough about what a perfect romantic suspense Lisa Kamps has written here! Her style is so refreshing! All of the elements that I want to see are put together in a way that made this an unputdownable very late night read for me. Drama, suspense, danger, chemistry, romance and steamy heat; together with absolutely stellar characters (both main and supporting) an infusion of humor and a storyline that will grab you and hold on until the end. And what an ending! I love the way this epilogue is written! I can't wait for more in this incredible new series! !